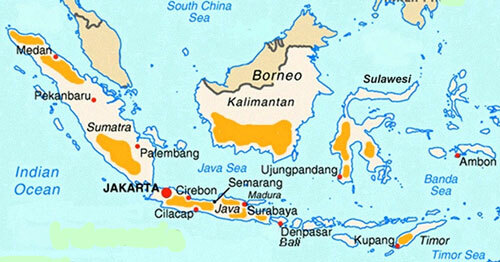 As of 2009, the archipelago that comprises Indonesia counted 17,508 islands within its territory. With tsunamis, volcanoes & earthquakes, that number will likely shift – as has cacáo’s fortunes here. Cacáo officially took root on these islands in 1778, brought to Jakarta & Sumatra by Dutch merchant shipping during a period when they were opening their colony to ‘foreign’ investments from other Europeans trading coffee, tobacco, & rubber as well as digging tin mines & drilling oil wells on the outer islands, & eventually greater influence from Islam too which would split Indonesian society between authoritative santri Muslims (wealthy & worldly) vs. oppressed abangan Muslims (poor & provincial). Sourced in all likelihood from the Spanish colony in The Philippines & called ‘Java Criollo’, it was esteemed for being relatively pure & of highly consistent quality. Then in 1888 two trees made the voyage to Java from, speculatively, Sri Lanka. One perished. The lone tree survivor traced distant roots all the way back to Venezuelan Trinitarios & interbred with already existing Criollos on the Djati Roenggo Estate in Central Java where in 1912 a breeding program began under the direction of Dr. C.J. van Hall. The initial clones of this program – DR 1 & DR 2 – are still in use along with the popular DRC 16. Their progeny evolved into today’s Java ‘A’, a genetic trail with strong Criollo germplasm. A survey of the island by Toxopeus & Geisberger in 1983 indicated continued high Criollo presence, including a ‘Java Porcelaine’ (suspected, however, to be Amazonian) – a variety introduced on the island after a volcanic eruption devastated many plantations. Elsewhere in Indonesia, cacáo is typically of bulk variety, especially Sulawesi, which now ranks among the world’s largest producers, supporting over 300,000 small farmers. Genetetically derived from Amazon & West African Amelonado clones, Sulawesi is also notable for its cacáo butter hardness. Recently the crop has been afflicted with “black pod” disease & the “cocoa pod borer”, the latter a small moth that lays its eggs deep inside pods, allowing its larvae to snack on the beans. Mars of candy bar fame & ACIOR from Australia have responded by planting an “improved” clone to replace older trees.